Expanding RISK-style across the West Coast since the late '80s (you're next Kamchatka! 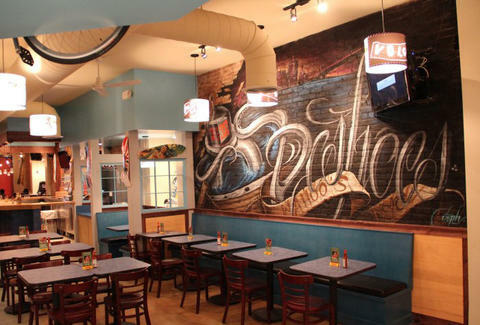 ), Wahoo's is a casual taco chain (started by a trio of Chinese/Brazilian surfing bros) invading the East Coast this Monday with an aqua-colored, Cantina-style shell in Gramercy. The interior'll sport murals from streetwear brands Element and DC Shoes, and be literally decked by local co Bustin Boards with "one-of-a-kind, hand-screenprinted" skateboards, which your dad will definitely hate, leading to a huge fight where you'll inevitably have to tell pop, shove it. Stomach-fellaters include their iconic fish soft taco topped with a sharp cheddar jack blend, homemade salsa, and shredded cabbage (an original unchanged recipe since 1988), burritos like the Outer Reef filled with your choice of meat (braised pork/chicken/fish...), black or Cajun beans, and "green sauce", plus non-tortilla joints like the rice-based Maui Bowl, shockingly filled with teriyaki steak, and not a 6-6 team from the MAC. Unlike most of its more straight edged, Left Coast cousins, this 'hoo's will bust out a full bar stocked with local brews from BK's Kelso and an occasionally crazy, tropically leaning cocktail list, with options like Brody's Bon Fire Margarita (with jalapenos and hot sauce), an energy drink-blasted cran/vodka called Godzilla, and the Mexican Mojito w/ agave and cactus leaf, so expect too many to make you a total prick. And aiding in the full embrace of their first east-of-the-Mississippi location, they'll have a display up front featuring rotating goods from local brands, with the first spotlight on Glamour Kills, which your dad has been saying about your modeling job for years, despite all of your finger flips.